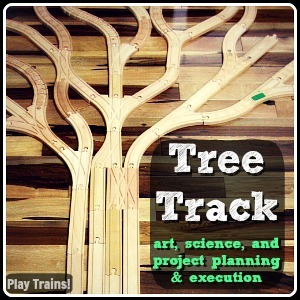 I had a question over on the Play Trains! Facebook page as to how we store our trains. I had taken a few photos of our system a while back, intending to eventually post them, but this gave me the nudge I needed to take a couple more pictures get this up. 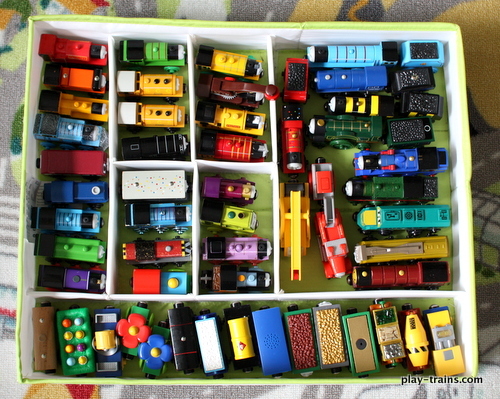 By far, my favorite way to store our trains and track is with drawer organizers. 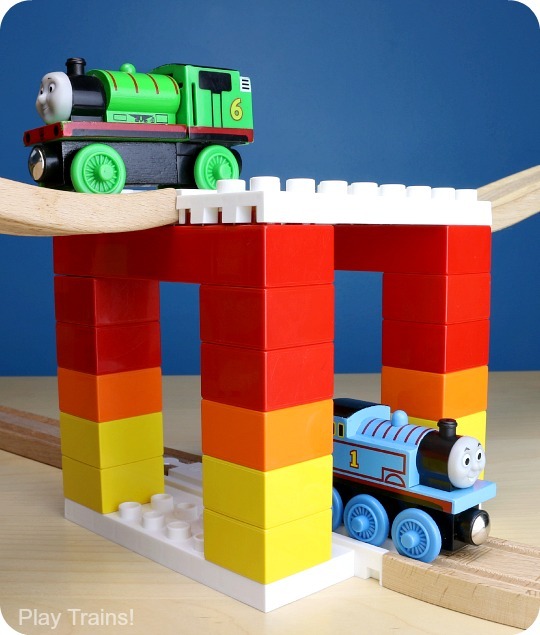 We use two different types from Ikea, one for track and one for trains. When we want them out of sight and out of the way, these slide right under our couch, armchair, and the Little Engineer’s dresser. For track, we have the Skubb box with compartments. 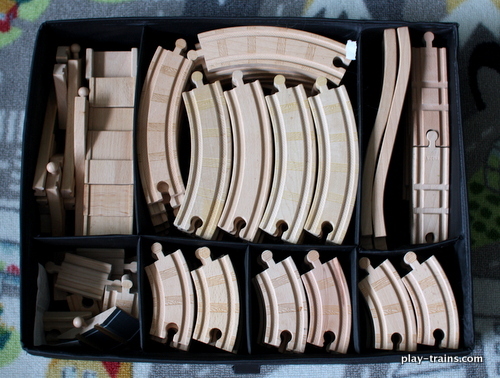 The different compartments are very conveniently sized for the standard track pieces. 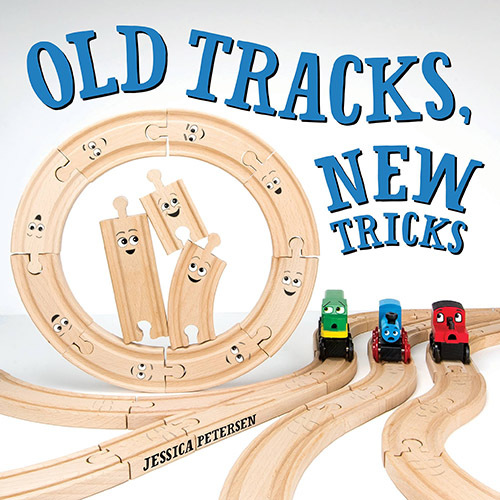 Small curved and straight tracks fit in the small compartments; large curved and straight tracks (and sets of two four-inch straight tracks connected together) fit snugly in the larger compartments. Aside from unusually long straight tracks, the only thing that doesn’t fit particularly well are the ascending tracks, but we make it work. Even when we’re just going to put the tracks back together again in a new configuration, I like to organize them anyway. It makes life so much easier when you can find a certain track, or see how many male-male adapter pieces you have left. In one of the organizers, I devote one small compartment each to two-inch (or smaller) straight tracks, m-m or f-f adapters, buffers/ramps/things that end tracks, and Suretrack clips, and that helps so much. For the engines and cars, we use the Kusiner box with compartments, found in the children’s department at Ikea. It has a lower profile than the other organizer, just a bit taller than the trains themselves, and the compartments are just the right size. No pictures of these, but we also have a few Glis boxes for organizing accessories — signs, trees, people, animals, and freight — and black Dröna boxes hidden in our unused fire place for larger pieces like stations, mountains, and bridges. 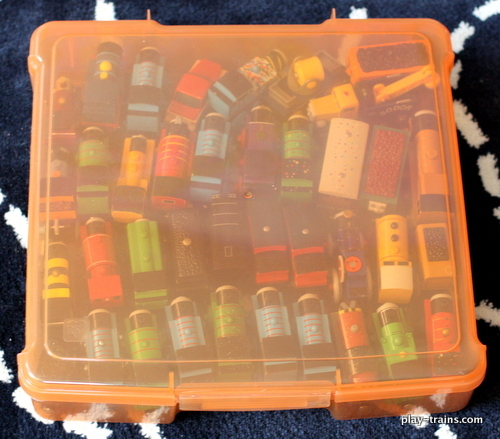 One other option we sometimes employ are these plastic craft project boxes. We picked up a set of five at Costco last year. They have them again this year, only from a different company with what looks like better latches to keep them shut, something we’ve had a problem with. The lid is nice when we’re taking a bunch of track and trains with us when we visit one set or the other of the Little Engineer’s grandparents. 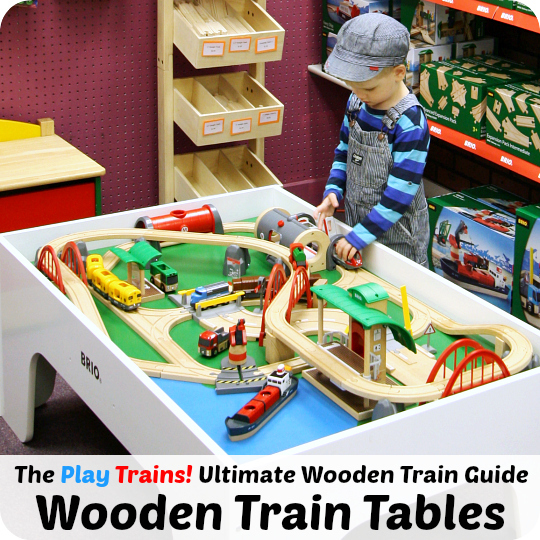 The boxes are just the right height for the trains, so with the lid down it keeps them from being jostled too much. We don’t use this for trains at home, though, because the lid gets in the way of the Little Engineer getting at the trains. 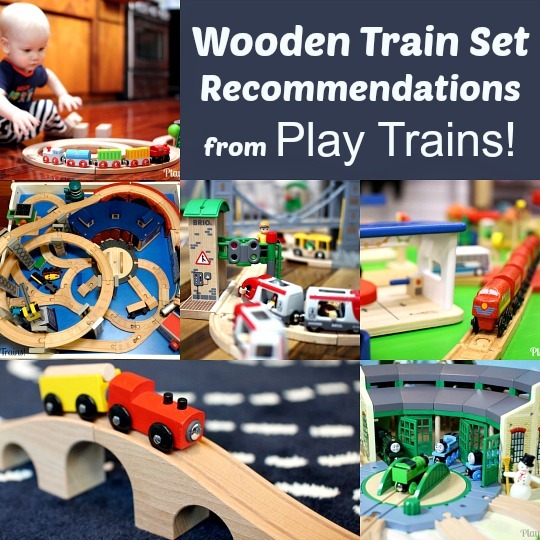 Another option that we don’t have is a wooden train shelf. 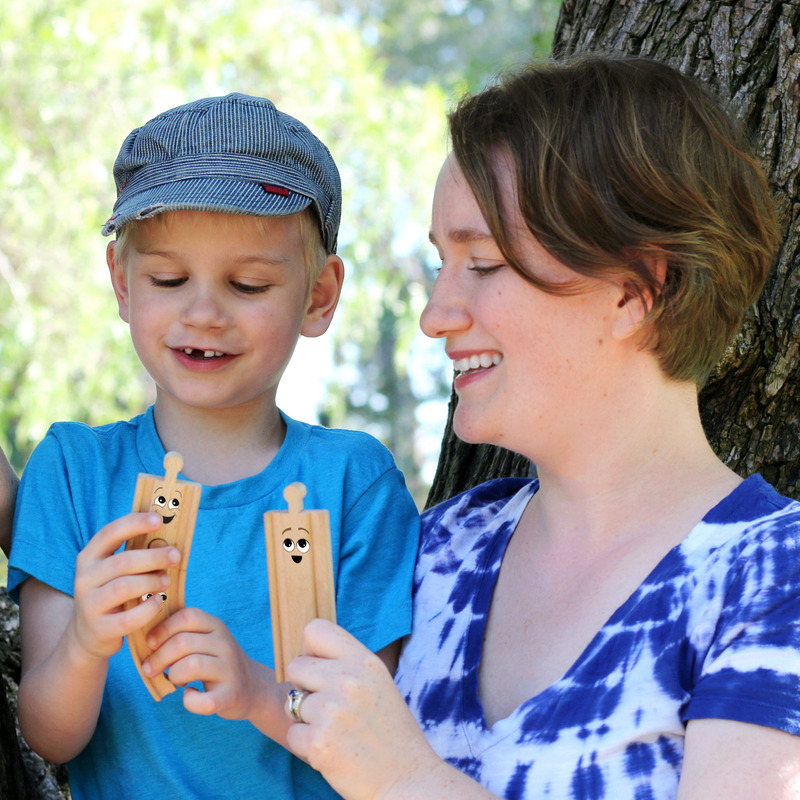 We don’t have one yet, but they would certainly look great in the Little Engineer’s room. I wonder, however, how often the trains would actually be on the shelves. 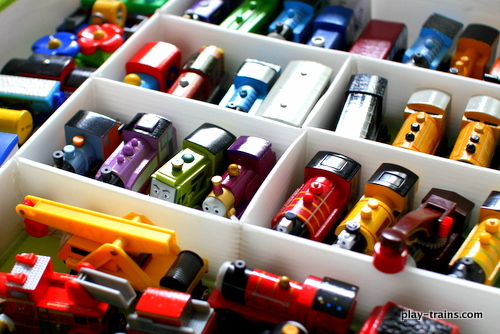 Great idea to store trains in Scrapbook paper boxes! Need. Some.!! Thanks! They fit perfectly. For traveling with them, I’ve also added another thin layer on top before closing the lid, like a baby blanket. That makes them really secure. This is a fantastic idea, our trains are usually set up in the middle of the floor (which we walk over) or in a number of bins. I like the little compartments and the container would slide well under a bed. Thanks for the tip! Truth be told, our trains are usually all over the floor, too. But we have so much train stuff we can’t play with it all at once, so more and more there is actually stuff in the organizers at any given time. 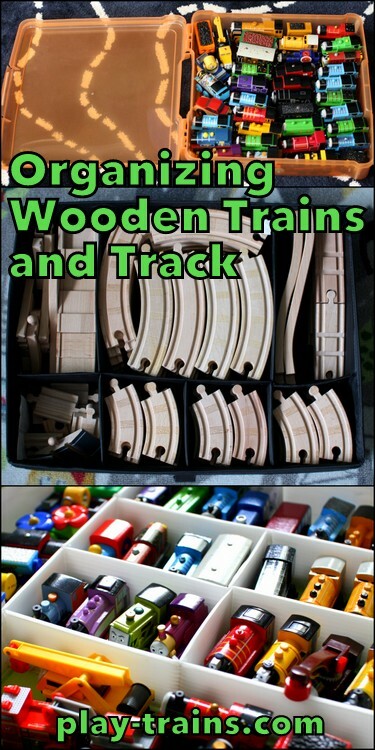 Well, our trains and track are about the only things that are organized around our house a lot of the time! Working on that, though…just got the LIttle Engineer’s room organized so he can actually find his toys to play with them. Now for the rest of the house. 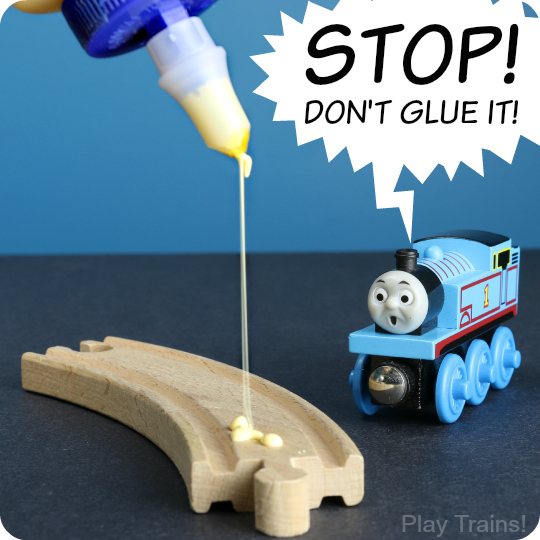 I organized my son’s train table today, before I found this blog. I too used IKEA SKUBB, the “set of 6” boxes. Such a good idea! Hi there! 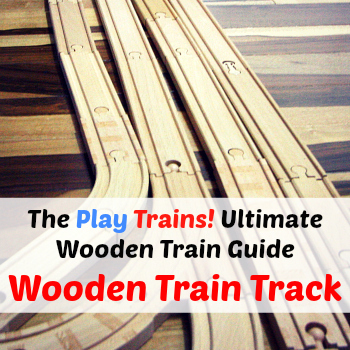 My little engineer has grown out of most his train obsession but I want to keep his wooden tracks. I just wanted to let you know that most of your links to IKEA are broken. I was able to find most by searching but not all. Love your site!! !